The past week has been a crazy one, filled with unexpected challenges as we packed and loaded everything from one house then drove across the country to our new home. Our furniture and most of our belongings aren’t here yet, but our family is together again and we’re working on settling in. With just about 2,500 miles to travel and an estimated drive time of around 34 hours (completed in 60 hours), I had some projects ready to keep my hands busy when it was my turn to be a passenger. The first project I planned for was the free Infinity Houndstooth Scarf pattern by Kathy Lashley. The pattern calls for two skeins of Aran weight yarn, one each in black and white, and a US-I (5.5 mm) crochet hook. I packed Patons North America Classic Wool Worsted in 202 Aran and 226 Black. My US-I hook is 5.25 mm so I opted for my US-J (5.75 mm) hook instead. The pattern was perfect for a road trip. It’s essentially alternating two stitches throughout while switching colors after each row. It was easy to work by feel while enjoying the scenery and talking. Some of the reviews on Ravelry said the project is quick, while other said it takes a long time; I finished it within 48 hours. I connected the ends with a single twist for a Moebius cowl that I look forward to wearing this autumn. 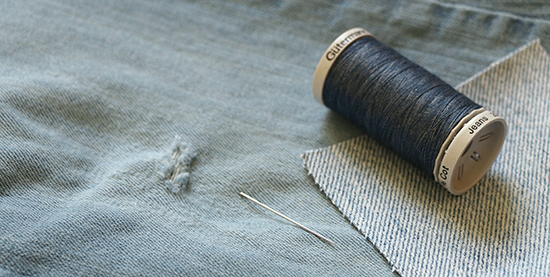 Next up was some mending. One of my go-to pairs of jeans developed a hole above the knee shortly before we moved. 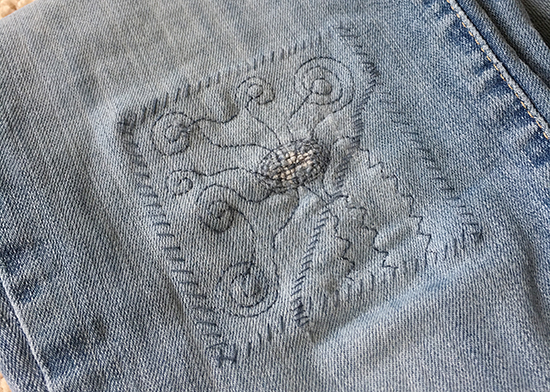 I couldn’t iron on a patch because my iron was already packed, but I had some denim scraps, thread, and a hand needle available for a more traditional patch. This project took a little more concentration, but was ideal for a stretch when we were stuck in barely moving traffic. I had a plan in mind initially, then a new plan, and ended up basically doodling with thread. Doodle interpretations are probably not very reliable, but I had time so I looked mine up. The circles represent a need to find unity and peace, while the zigzags represent a desire to get on with things. That sounds about right! And, finally, just before we left we made a trip to a bookstore because books are good for any occasion. 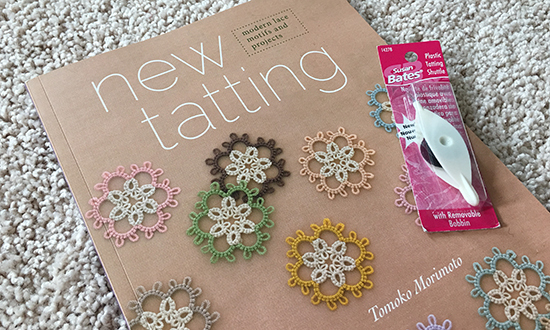 I found the book New Tatting by Tomoko Morimoto. I’ve never tatted before, but it seems like it would be ideal while travelling because it would take up so little space; all that’s needed is thread, a shuttle, and scissors. The projects in the book are beautifully photographed, and the instructions seem simple enough. I’m trying to resist buying thread because I know I have a lot on the moving truck, but I already picked up a shuttle so I’ll be ready to go once we’re unpacked. What are your favorite travel projects? Wow!! That is SOME patch!! Thanks! They're not going to be a go-to pair of jeans any more because the patch is too noticeable, but I like it. Noticeable? People would pay extra for that! They are beautiful. Great point, Linda! Thank you! My Grandma was the best jean patcher, ever. She sewed a very utilitarian patch....I like yours a bit better. Very creative! Thank you! Time will tell whether it's utilitarian as well.